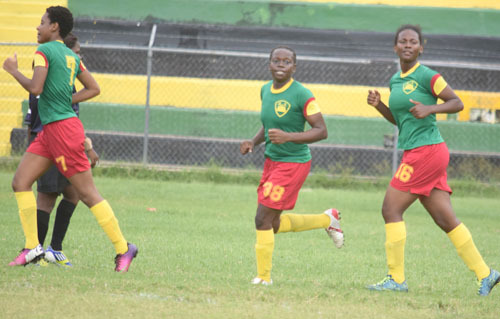 Real MoBay players strut off in celebration after scoring a goal against Central Lynx during the 2016 season of the Women’s Football League match played at Jarrett Park. Two of the players featured in the photography (nearest right) are expected to be key components for the team this time around as they bid to mount a challenge. After a year’s absence due to a lack of sponsorship, the revamped six million dollar Women’s Football League – which will see a new champion crowned – returns this Saturday with a full slate of four matches. The League, which has attracted the partnership of the Lascelles Chin Corporative Credit Union and the Jamaica Football Federation (JFF), has been sponsored to the tune of $6.5 million with the winner to walk away with $500,000. Real MoBay and Trelawny Women are the western teams in the draw and they have been placed in Zone B, alongside Arnett Gardens and SC Monarchs. The Real MoBay team, under the guidance of Marvin Peterkin, is scheduled to open their campaign against the usually high-flying Arnett Gardens at the Green Pond High School, kicking off at 4 p.m. The home team has been going through their paces ahead of the fixture and their coach Peterkin – who knows his way around the winning circle – told the Western Mirror that this time around, his team “is expected to give a good account”. “We have missed out on progress to the second round in recent seasons, but this year, with the wealth of talent at our disposal and their eagerness to shine, I’m expecting a really solid season,” the soft-spoken Peterkin declared. Meanwhile, the second western team in the competition, Trelawny Women, are also listed for competition at home as they are scheduled to face off with SC Monarchs at the Elleston Wakeland Centre. Ten teams separated into two zones of five are down to participate in this year’s League. Real MoBay, Trelawny Women, Arnett Gardens, Olympic and SC Monarchs are the teams paired in Zone B. Waterhouse, St. Ann Women, Rangers FC, Fraizers Whip and Cavaliers are the teams listed for competition in Zone A. Three heavyweights, G.C. Foster, Los Perfectos and Barbican – who has won the title for the last nine seasons – will not take part in this year’s League for undisclosed reasons.